I want to start this off by saying that this will not be an objective review. I'm not going to be looking for the most efficient way to make a tournament-winning GSC List. I'm looking at it from the perspective of trying to make the kind of GSC Army I want to run, largely for Narrative games. Much of the analysis will still be relevant for competitive play, but the final conclusions will likely not. Universal Rules: These will apply to all GSC Units, tho some only in Battle-Forged Armies. - Cult Ambush: This is pretty much the defining Special Rule of the Army. Each time you would Deploy a Unit with this Rule before the game, you can instead choose to place an Ambush Marker. Then, at the start of your first Movement Phase or the end of your Opponent's first Movement Phase, whichever comes first, you replace each counter with a Unit of your choice. If the Unit is an Infantry or Bike Unit, instead of placing a Marker, you can choose to put the Unit in Reserves in underground tunnels, to emerge via the usual "Deep Strike" Rules at the end of one of your Movement Phases. Making good use of Cult Ambush is going to be crucial to gain a strategic edge that will offset the general fragility of GSC Units. - Unquestioning Loyalty: Basically a Look Out Sir! type of rule. If you have a Unit of the same Cult with this Rule within 3" of a Character when they fail a save or take a Mortal Wound, on a 4+, you can sacrifice a Model from the nearby Unit rather than applying the results to the Character. Works in both Shooting and Close Combat, and there are various ways to improve the roll. - Insurrectionists: The usual "Objective Secured" Rule for Troops. - Brood Brothers: Brood Brother Units can be included in a GSC Detachment without losing your Cult benefits. They can also sacrifice themselves for Unquestioning Loyalty regardless of the Character's Cult. However, they themselves do not gain Cult benefits. - Brood Brothers Detachments: For each GSC Detachment in your Army, you can include up to one Astra Militarum Detachment in your Army even tho there are no Faction Keywords in common. They replace their Regiment Keyword with Brood Brothers, gain +1Ld and the Unquestioning Loyalty Rule, and cannot make use of anything Regiment-specific or any Unique Characters. Furthermore, the Command Benefits of any Brood Brothers Detachments are halved, rounding up. Finally, Brood Brothers Characters cannot be given Cult Relics. - Tyranids: Not strictly a special Rule, but it is worth noting that most GSC Units have the Tyranids Faction Keyword, allowing you to take Tyranid Detachments as part of the same Army. - Stratagems: I'm going to skip a number of them that are fairly standard, or particularly weak/boring. -- They Came from Below: 1 CP, remove up to three of your Ambush Markers while revealing Units in the first Turn, and shift that many Units from Ambush to underground tunnels. -- Meticulous Uprising: 1 CP, move up to 3 of your Ambush Markers up to 12" each. They still have to follow all the usual restrictions. -- Scanner Decoys: 1 CP, set up an extra three Ambush Markers when Deploying a Unit in Ambush. Once per Game only. -- A Perfect Ambush: 3 CP, lets you move an Infantry or Biker Unit d6" immediately after setting it up, either from an Ambush Marker or underground tunnels. Explicitly works on Units that arrived from Reserves this Turn Alternately, let the Unit shoot immediately. In either case, it places no restrictions on the Unit's later actions. -- Lying in Wait: 2 CP, lets you set up a Cult Ambush Unit arriving from Reserves anywhere more than 3"(!) from an Enemy Model. It can't Charge that Turn, but amazing for getting stuff like Flamers in close, and you can use it on Unit while using A Perfect Ambush on another in the same Turn to really put pressure on. -- Return to the Shadows: 1 CP, lets an Infantry or Biker Unit return to Reserves and "Deep Strike" at the end of your next Movement Phase. A repeat from Chapter Approved, but the changes to Cult Ambush make it effectively a new Stratagem. *** Collectively, these let you be even more of a jerk with Cult Ambush. So many great ways to screw with your Opponent. -- Lurk in the Shadows: 2 CP, makes an Infantry Unit un-targetable unless it's the closest Unit to the shooter. Has to be used at the start of the Opponent's Shooting Phase, tho; you can't use it reactively. -- Clandestine Goals: 1 CP, you get to keep your Tactical Objectives secret in a Maelstrom Mission. -- Devoted Crew: 1 CP, lets a damaged Vehicle use the top row of its profile for the Turn. Very handy for getting one more good Turn out of a Vehicle before it gets finished off, or bump it back up so it has enough Movement to get to an Objective or something. -- Broodcoven: 1 CP, usable if a Patriarch is your Warlord. Gives a Magus and a Primus each a Warlord Trait. Very cool, and a great way to get use from some of the Warlord Traits that would be risky to use with your actual Warlord. -- Hyper-Metabolism: 1 CP, heal d3 Wounds on a Character at the start of your Movement Phase. The inflexible timing is annoying, but given some of the Characters available, this is going to be very useful. -- Cult Reinforcements: Return up to d6 slain Models to a Troops Unit at the start of your Movement Phase. Allows for even more shenanigans than Hyper-Metabolism, since you can string the Models out to better reach an Objective or something. -- Rigged to Blow: 1 CP, makes one of your Vehicles automatically Explode when Destroyed. Unfortunately only works on Vehicles with a Cache of Demolition Charges. But still pretty cool. And, frankly, probably a better reason to add a Cache than actually using it shoot is. -- Detonate Concealed Explosives: 2 CP, pick an Enemy Unit, on a 4+ they take d3 Mortal Wounds. -1 to the roll if targeting a Character, +1 if targeting a Unit with 10 or more Models. On a 7+, goes up to d6 Mortal Wounds. Annoyingly, has to be used at the start of the Shooting Phase, so you can't use it to try to polish off some Unit that you just couldn't quite drop, but still, very handy for picking away at things that are hiding out of LoS, well-screened from Deep Strikers. -- Focus of Adoration: Infantry and Biker Units gain the ability to perform Heroic Interventions while within 6" of the Warlord. The Trait from Chapter Approved. Heroic Interventions can be very useful, and being able to make them with a variety of non-Character Units opens up a lot of potential pitfalls for your Opponent. Especially since the Unit doesn't have to be wholly within 6", so you can spread quite a net with it. -- Shadow Stalker: -1 to Hit for anything targeting your Warlord. Seems hard to go wrong with. -- Biomorph Adaptation: +1 Strength and Attack. Very handy for a Combat Warlord, and there are a few Relics it combos with particularly nicely. -- Born Survivor: Reduce damage taken by 1, to a minimum of 1. With the relatively low Wound counts of GSC Characters, this feels pretty weak to me. -- Alien Majesty: +3" range to Aura abilities. There are some pretty strong Aura abilities on GSC Characters, including on the 3 Broodcoven Characters, so this definitely has potential. -- Preternatural Speed: Always fights first. Pretty handy, especially given how fragile many GSC Characters are relative to their damage output. --- Conclusion: A pretty nice spread, with only one real dud that I can see. It's also nice that there don't seem to be any that render one or more of the Cult Warlord Traits pointless. I can see most of these getting used, but in very different Armies. 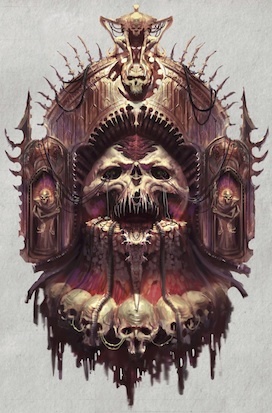 -- Icon of the Cult Ascendant: The Chapter Approved Relic. 6" +1S Aura for Infantry and Bikers. It affects Units, not Models, so you can spread it out pretty well. Seems usable by Armies focusing on CC, especially since most of the GSC Units are in the S3-4 range, where a +1 buff often makes quite a difference. -- Sword of the Void's Eye: A vastly improved Bonesword. Extra S, AP, and Damage, re-rolls to Hit and Wound. Basically, if you want to use a Primus as a Combat Character and have a Relic slot available, they should be carrying this. -- Amulet of the Voidwyrm: +1 to Saves against ranged Attacks, and can't fire Overwatch at the bearer. Both situations that Characters shouldn't be in unless you screw up. Fail. -- Scourge of Distant Stars: +1 to hit in Melee, and natural 1s targeting this Character in Melee cause a Mortal Wound on the Attacker's Unit after the attacks are resolved. Seems very fun against Hordes, but so many Factions have ways to re-roll 1s, and pretty much everyone you'd want to give it to is already WS2+. Pass. -- Oppressor's Bane: Basically one of the Kelermorph's guns with +1S and AP. Can also replace an Autopistol. As with pretty much all GW's Relic Guns, it feels like the opportunity cost of not taking some other Relic is too high. Pass. -- Dagger of Swift Sacrifice: Replaces a Cultist Knife or Sanctus Bio-Dagger. Basically a Bio-Dagger that causes an extra d3 Mortal Wounds on any Character Wounded by it, but not Slain. Similarly to Oppressor's Bane, it's not outright bad, but really doesn't feel worth spending a Relic slot on. -- The Crouchling: Replaces a Familiar. The Character knows one more Broodmind Power, and gets +1 when trying to use any Broodmind Power (so basically any Power other than Smite). There are a number of good Broodmind Powers, and most of them have Warp Charge values of 6 or 7, so this seems like another very useful option. -- The Gift from Beyond: Relic Sniper Rifle. +2 to Wound as long as you're not targeting a Vehicle or Titanic Unit. Takes your Wound roll to 2+ against most Support Characters. The GSC Sniper options are going to need at least two shots to drop almost all Support Characters under even the best of circumstances, so if you're planning on relying on one of them, Give 'em this. There should usually be better options, tho. --- Conclusion:The Crouchling, the Icon Ascendant, and the Sword of the Void's Eye seem like the really usable ones here. A bit disappointing compared to the spread of the Warlord Traits. -- Mass Hypnosis: WC7, 18" Range, target Unit gets -1 to hit, can't fire Overwatch at all, and fights last, even if it Charges. Pretty sweet, either for setting up a Charge into a fairly nasty Unit or bracing to receive one. -- Mind Control: WC7, 12" Range, if you beat the target Model's Ld, you can immediately make it shoot another Enemy Unit, or make a single Melee Attack at one. Cool effect, but the Range is a big limitation. Probably not usually worthwhile. -- Psionic Blast: WC5, 18" Range, if Target passes a Ld Test, it takes a Mortal Wound. If it fails, it takes d3. That can pretty reliably put a Mortal Wound on just about anything, and it doesn't have the targeting restrictions of most Psychic Attacks. -- Mental Onslaught: WC6, 18" Range, pick a Model, roll off and add your Ld. If you win, they take a Mortal Wound. Keep going until the target Model dies or the Opponent manages to equal or beat your total. Harlequin Players are pissed about this one. They used to have essentially the same power, but it got badly nerfed. The GSC version is easier to cast, and the Patriarch has a better Ld than Shadow Seers do. A good way to pick off buffing Characters while your Patriarch is fighting through the Units they're buffing. -- Psychic Stimulus: WC6, 18" Range, target Unit can Advance and Charge, and also strikes first until the start of your next Psychic Phase. One you should probably build for to some extent rather than just using it randomly. There are various effects available to GSC that can boost Advance and Charge rolls, and this lets you double up on those. -- Might from Beyond: WC7, 18" Range, target Infantry or Biker Unit gets +1S and Attacks. Do I really have to say how good this is for an Assault Army? --- Conclusion: Mass Hypnosis, Psionic Blast, Mental Onslaught, and Might from Beyond all seem pretty generally useful, and even Mind Control and Psychic Stimulus are, at worst, situational. The Cults: Each of the six sub-Factions of the Genestealer Cults has their own Creed, Stratagem, Warlord Trait, and Relic. Note that Purestrain Genestealers and Patriarchs do not benefit from Cult Creeds. -- Creed - Subterranean Ambushers: Units with this Creed add one to Advance and Charge rolls during their first turn on the battlefield. Very handy for making Charges with Units emerging from underground tunnels. Also note that Psychic Stimulus will let you "double dip" on this one. -- Stratagem - A Plan Generations in the Making: 3 CP, cancels out an enemy Stratagem on a 2+. On a 6, they lose the CP spent on it, too. Very powerful, expect this to get nerfed like Agents of Vect was. -- Warlord Trait - Inscrutable Cunning: Gain d3 CP at the start of the battle, and get one free re-roll on a Hit, Wound, or Saving throw. A fairly common sort of Trait. Not bad at all, since GSC have some very good stratagems, and some of those are quite expensive. -- Relic - Sword of the Four-Armed Emperor: A Power Sword that grants the user four extra Attacks. Replaces a Bonesword or set of Locus Blades. Not inherently bad, but only available to a couple of squishy S4 Characters. The best use I can see is on a Primus who has been given the Biomorph Adaptation Warlord Trait via the Broodcoven Stratagem, but even then, that's a lot of investment in a very fragile character. --- Conclusion: For me, the Creed is the real draw here. The Stratagem and Warlord Trait are good for competition, but kind of boring, and the Relic seems pretty underwhelming regardless. This would be my guess for the most common competitive Cult, tho. -- Creed - Devoted Zealots: Re-roll failed Hits when Charging, Charged, or Heroically Intervening. A "win-more" Rule that only really helps things that don't need it. Not enough to turn Shooting Units into Assault Units, and likely to result in Assault Units overkilling their targets and getting left in the open. -- Stratagem - Vengeance for the Martyred: 1 CP, Used when a Character is killed, get +1 to Hit on the Unit that killed them. GSC have a lot of cheap Characters, so this could actually end up being pretty useful. -- Warlord Trait - Beloved Grandsire: +2 to Unquestioning Loyalty rolls for the Warlord. Not bad, especially for Scenarios where killing the Warlord is worth extra VPs. -- Relic - Reliquary of St. Tenndarc: Units within 6" Auto-pass Morale. Models within 6" can shoot or fight when slain on a 4+. Similar to the Space Marine Ancients. The Morale effect makes larger Units more viable, but hitting back is less valuable than it is with Space Marines, since individual Models are less powerful. --- Conclusion: Pretty good. The Relic making big Units viable is nice, as is the Stratagem, and the Warlord Trait is good for Narratives. I just don't like the Creed or the other half of the Relic's benefit. -- Creed - Disciplined Militants: Halve the number of Models that flee from failed Morale tests. Can also Fall Back and still shoot at -1 to Hit. Helps make larger Units more viable, without being tied to a specific Character's Aura. The Fall Back and shoot is less impressive at BS4+ than for Ultramarines, tho. -- Stratagem - Chilling Efficiency: 2 CP, used after you've inflicted damage on an enemy Unit in the Shooting Phase to give +1 to Hit for any of your Units that target this one later in that Phase. Situational. Crap against most MSU, and even with this bonus, Stealer Cult aren't really good at taking out hard targets like Knights or something in shooting. Good against Hordes, tho, which is handy these days. -- Warlord Trait - Hivelord: 6" Aura of re-roll 1s to Hit with ranged weapons. GSC don't have a whole lot of ways to get re-rolls when shooting, so this is worth noting. On the flipside, most of their shooting isn't very good, so it's not worth a whole lot more than that. -- Relic - Vockor's Talisman: Re-roll Hit rolls for the bearer when fighting Enemy Characters. Also adds a Mortal Wound on Wound rolls of 6+ for the bearer's melee attacks. Maybe usable for a Patriarch, but I don't like things that trigger on 6s, and Character duels aren't actually that common in my experience. --- Conclusion: The Hivecult are trying to make GSC into a full-on shooting Army. Boosting an Army's strengths is usually a better option than shoring up their weaknesses, and it's not really a direction I want to go with GSC, so I'm calling this one a hard pass for me. -- Creed - Cyborgised Hybrids: 6+ Invul, or +1 to Invul for Models that already have one. Infantry can Move and fire Heavy Weapons without penalty. The 6+ Invul is pretty meh, since GSC don't have much worth shooting with weapons that will take their Save down that far. And half the things that already have an Invul are unaffected by Cult Creeds, so that part is basically just Kelermorphs and Loci. But being able to Move and fire with Mining Lasers and Seismic Cannon is honestly pretty sweet. -- Stratagem - Overthrow the Oppressors: 1 CP, one Unit gets extra Attacks on unmodified 6s to Hit. Improves to a 5+ against Imperium, and a 4+ against Admech. Can't be used on Genestealers or Patriarchs. Things like Abberants with Power Picks, Metamorphs, or even just Acolytes can kick out a ton of Attacks, which gives this lots of chances to trigger. I don't think I'd pick Bladed Cog specifically for the Stratagem, but it's a good one to keep in mind if for anyone who does use this Creed. Especially when up against AdMech. -- Warlord Trait - Single-Minded Obsession: Pick an Enemy Unit after Deployment. Units within 6" of the Warlord can re-roll Wound rolls against the target Unit. Probably not a go-to, but maybe worth taking against some Opponents (Possibly via Broodcoven). Works nicely with the Move and fire part of the Creed. -- Relic - Mark of the Clawed Omnissiah: 4+ Invul (which the Creed will buff to 3+), and after a successful Charge, inflict a Mortal Wound on a Unit within 1" on a 2+. Good for some of the squishier Combat Characters, but still probably better to just leave that sort of thing to Patriarchs. --- Conclusion: The main draw here to me is the Move and fire Heavy Weapons part of the Creed. The rest ranges from decent to unimpressive. -- Creed - Nomadic Survivalists: +1 to Saves against Attacks with an AP of 0 or -1. Bikers can Move and fire Heavy Weapons, or Advance and fire Assault Weapons, without penalty. This gets most of your dudes up to a 3+ Save against small arms fire while in Cover, which is pretty awesome. The buff to Bikers is mostly just a nice little extra, but is very nice for Jackal Alphas, letting them fire that Sniper Rifle while moving up to 14" without penalty. -- Stratagem - Drive-By Demolitions: 1 CP to add 1 to Hit and Wound with a Biker Unit's Grenades. The Unit then gets to make a free Move, but can't Charge that Turn. When going for the Grenade benefit, this is effectively a 2 CP Stratagem, because it's virtually always going to be used alongside Extra Explosives to allow multiple Models to throw Grenades. Even without that, tho, 1 CP for a free Move with Bikers ain't bad at all for jumping on an Objective or getting up in someone's face to block movement or something. -- Warlord Trait - Entropic Touch: 6" Aura granting an extra point of AP on Wound Rolls of 6+ in Close Combat. As with Overthrow the Oppressors, there are Units that can toss out enough Attacks to get some real benefit out of this. Very usable. -- Relic - Metallophagic Stave: Magus only, unfortunately, but it buffs their Force Stave to AP-5, and gives it "Haywire", causing a Mortal Wound on Vehicles in addition to normal damage on a Wound roll of 4+, and d3 Mortal Wounds on 6+. Even just on a Magus, that's pretty good, especially if buffed with the Biomorph Adaptation Warlord Trait. --- Conclusion: This one really appeals to me. I tend to be a "counter-puncher", so I like durability boosts, and it buffs the Atalan Jackals, who I like anyhow. Some pretty usable options for offensive boosts, too. -- Stratagem - Monstrous Bio-Horrors: 3 CP, lets an Abberant Unit fight again at the end of the Fight Phase. Also -1Ld until the end of the Turn for Enemy Units within 6" of that Unit. Fight Again Stratagems are always good, and even tho this one is pretty restrictive, it's restricted to options that are going to make good use of it. -- Warlord Trait - Bio-Alchemist: Increase the Damage of the Warlord's Weapons by 1. Doesn't apply to Relics or Weapons modified by Relics. It does apply to all other Weapons, tho, shooting or melee, which is pretty cool. I could see a Sanctus or Jackal Alpha getting a lot of mileage from this one, on top of the usual suspects like a Patriarch or Abominant. -- Relic - Elixir of the Prime Specimen: +1 Attack, Toughness, and Wounds. Hard to argue with that, especially on something like a Patriarch or Abominant, and even more so with the Biomorph Adaptation Warlord Trait. --- Conclusion: Arguably the most Assault-focused of the Cults. A definite focus on Abberants and Abominants, too. One I would probably go for if I were looking for a "horror movie" type of narrative. Well, if you made it through that wall of text, congratulations! I hope you found something of interest in there. To me, this is mostly for thinking my way through how I want to develop my own GSC Army, so if anyone else benefits from it, that's kind of a bonus. I'm going to be alternating with Modeling/Painting posts so as to not overload anyone with this. Until next time, y'all have a good one, y'hear! Sorry, just started skimming/scrolling as I'll likely not field this army. It did sound pretty cool though till my eyes started to cross...kinda ironic considering just how wordy I often tend to be. I don't blame you. It's quite the wall of text. Stealer Cults are one of my favourite bits of the 40K background, and I really like how this incarnation of their Army is looking, so I got just a teeny bit carried away. So what exactly happens when the enemy shoots at a blip? does it just disappear? Unit is revealed? I'm really looking forward to messing with the brains of the opponent with moving Blips 12in and having three fake Blips, so where they thought you were amassing troops you feint and have none... and the CotFAE creed adding 1 to charge from Underground will probably be the go to. What I am not looking forward to is painting an entire army... I only have a few Brood Brother untis and a Leman Russ painted so far! Yeah, I hear you on that. I've only got a couple of test Models so far. It's looking like Squaduary is going to get me up to at least Necromunda/Kill Team levels, and then we'll see where I get from there. On the third hand (gsc after all) I do love the idea of doing an ork genestealer cult, rare as they are, although not unheard of in the fiction, I have certainly read a ciaphus cain nove that featured them... perhaps the twisted helix would give me the best conversion opportunities/playstyle there. And to throw in a purestrain fourth hand, I do have a massive guard army I could use to help supplement my numbers till I get things off the ground, perhaps something that fits in with those existing assets would be a better starting point. Yeah, the number of options here are kind of overwhelming. One of the things I really appreciated in the fluff section was they they actually talked about Stealers infecting other species, and some pretty reasonable explanations of why humans are the most common species for Stealer Cults. Amusingly, it wasn't until after I decided from looking at the Rules that I liked Rusted Claw best that I looked at the pics of the different Cults and found I'd pretty much gone with their colour scheme when I first started messing with these almost a year ago.